I love mathematics. I have always been fascinated by arithmetic and geometry. 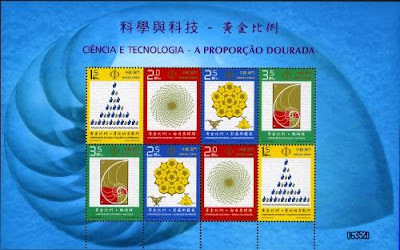 So I was particularly interested by the souvenir sheet issued by Macao on he 26th of October and entitled “Science and technology : the golden ratio”. So let’s speak a bit about mathematics. What is the golden ratio ? This is a ratio ;-) easy no ? Two quantities (let’s call them A and B, and take the assumption that B is greater than A) are said to be in golden ratio if the ratio between the sum of both quantities and the larger one (here A+B divided by B) is the same as the ratio between the larger one and the smaller (here B divided by A). 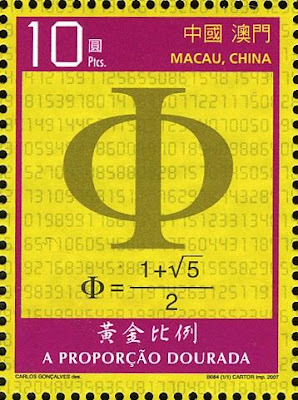 This ratio has a value equal to 1.6180339887… and is usually named using the Greek letter Phi. 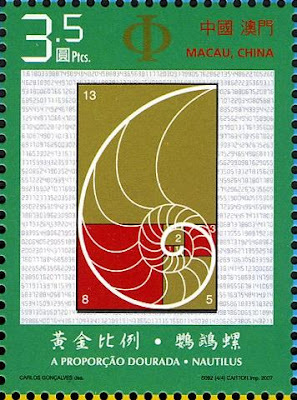 This is what is pictured in the first stamp of the souvenir sheet, the value of the golden ratio. This golden ratio is not only a mathematical object. This is also a concept that has been used in art. At least since the Renaissance, many artist have used the golden ratio to proportion their work because it is said to be aesthetically pleasing : a golden rectangle in which the ratio of the longer side and the shorter one is the golden ratio is considered as being particularly aesthetic. The golden ratio may be found in the proportion of the Parthenon, conceived by Phidias (490-430 BC). This is one of the first use of this ratio which is known in architecture and art. This is why it was “Phi” was chosen to name the ratio itself, because of Phidias. Plato, Euclid, Leonardo Da Vinci have made a lot of reference to the golden ratio in their work. So you see it goes far beyond mathematics itself. Even more, some people have discovered the presence of the golden ratio in nature. Da Vinci indicated that the ratio between some parts of the human body was following the golden ratio. Even in the animals or in the plants, some people are seeing this magic ratio, you will have some examples below. But first let’s speak about another mathematical object : the Fibonacci sequence. Fibonacci is the common name of Leonardo of Pisa, a mathematician who invented a very famous sequence in the 13th century. His idea was to answer to the following problem : if a pair of rabbits is placed in an enclosed area, how many rabbits will be born there if we assume that every month a pair of rabbits produces another pair, and that rabbits begin to bear young two months after their birth ? This is the Fibonacci sequence. You can notice that one element of the sequence is equal to the sum of the two preceding elements. 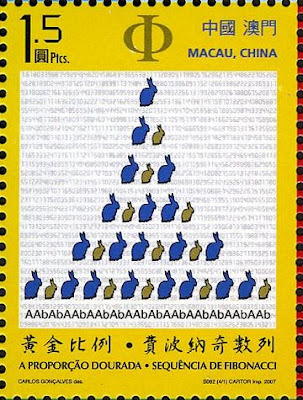 Here is another stamp from the same souvenir sheet, illustrating the sequence, using the rabbits story. What is the link between the golden ratio and the Fibonacci sequence ? Well if you divide on element of the sequence by its predecessor you get an approximation of the golden ratio ! And the bigger is the element you choose, the more precise is the approximation ! It’s magic ! From the Fibonacci sequence you can draw spirals. And here we find back the relation with nature. It is said that the shell of the Nautilus is following a spiral built on the Fibonacci sequence. 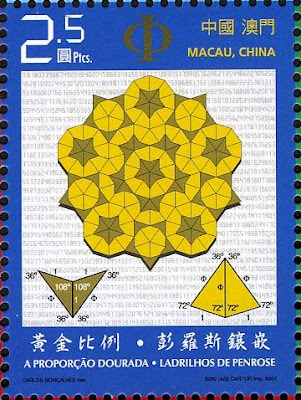 As illustrated in the following stamp. More, if you mix together several spirals, you get the pattern of the heart of a sunflower, as shown here. This is because it can be found in the Nature, that the golden ratio is sometimes called the divine proportion : as if God would have built our world, using the golden ratio as a metric. You see, that mathematics are fascinating. 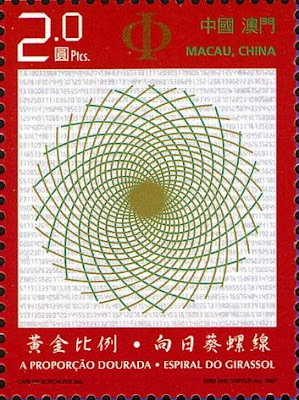 I wonder if there are people who collect stamps related to mathematics ? If yes, I would be glad to hear from them.